This lengthy post comes on the anniversary of one of the largest battles fought on the European mainland – Königgrätz, also known as Sadowa, in the Austro-Prussian “seven week’s” War, fought on July 3rd-4th, 1866. Nearly a quarter of a million men took part on each side, about 460,000 in total, with more than 1,300 guns. The outcome was decisive and cruelly disproportionate, with the Prussians suffering 9,153 casualties and the demolished Austrians no less than 44,313, an utterly devastating loss which led directly to the capitulation of the Habsburg empire and, consequently, Prussian ascendancy in the centre of the continent. This was not, of course, the only battle in this remarkable, short war, which followed just two years after the Prussians had dealt peremptorily with the Danes in 1864. There were significant encounters at Trautenau and Nachod on 27th June; Münchengrätz, Soor/Burkersdorf and Skalitz on 28th June; and Gitschin, Schweinschädel and Königinhof on 29th June. By the end of the month, the Austrian army had already been unhinged by the aggressive Prussian advances, and its command and control system was ill-equipped to deal with the new Prussian tactics that devolved initiative much farther down the ranks. Just a few days later, the ultimate – and fascinating – test was to come. Neglected for a long time, wargamers and military historians alike are blessed to have seen two new works emerge in recent years that seek to redress the yawning gap in the English literature on this subject. Two volumes in the Ken Trotman Wargaming in History series have been published, featuring the combined expertise of Major-General (Ret’d) John ‘DZ’ Drewienkiewicz and Andrew Brentnall, himself a senior adviser to NATO for many years at the close of a distinguished career in the Ministry of Defence. These gentlemen know their military onions! The first volume, published in 2013 (number 8 in the WiH series) was titled The Austro-Prussian War of 1866: the Opening Battles (ISBN 978-1-907417-43-6, 208pp, £31.50) and examined the encounters of the first week of the war enumerated above. The latest volume, Königgrätz 1866 (WiH 12 – 204pp, £35.00) was launched at the UK’s largest wargames show, Salute, earlier this year, and focuses exclusively on the eponymous encounter. “The greatest compliment I can pay this book is that I can’t wait to see the next instalment. At £31.50 it’s not cheap, but my goodness, it’s worth every penny. The reasons are several. First of all, it’s a lavish, hardback publication, absolutely stuffed with excellent maps, superb illustrations and a plethora of photographs of wargames in progress, conducted on accurately sculpted terrain that is itself based on the experience of the authors actually walking the ground. Secondly, it’s 1866: so little literature exists in the English language for the Seven Weeks’ War that the book immediately takes an honourable position on what heretofore has been a rather empty section of shelving. Thirdly, it’s a joy to read. Both the enthusiasm and the deep knowledge of the authors comes off the page at every turn. ‘DZ’ is a retired and distinguished Major-General, and he knows more about military ground than most, having been the British Army’s Chief Engineer and therefore responsible for shifting rather large quantities of the stuff. His writing partner Andrew Brentall works with the higher echelons of NATO and therefore also knows his military topography. That these two men, often in the company of others, have trodden the meadows and panted up the grassy hills of the battlefields of Bohemia and Moravia is evident, and the gaming that results is all the better for it. But the main reason that the book is a delight is that the combination of the two produces a seamless narrative that is quite simply impossible to put down. They have something of a genius for umpiring (I’ve been involved in a couple of their games in the past) and a rascally sense of humour which comes across quite clearly as they revel in the discomfiture of the opposing players as they wander blindly, for example, into marshy ground around Skalitz, or wield a deck of cards that has been rigged to force the Austrian commanders to attack when they would much rather sit back and avoid the Schnellfeuer of the Prussians’ deadly Needle Guns delivered into the head of their attack columns. Not that the Prussian players get it all their own way, because the one thing the Austrians can count on is the excellence of their often dominant artillery ‘umbrella’. It’s a fascinating little war, with real paper-scissors-stone challenges for the players just like those faced by their historical counterparts. The historical content is well-judged in both amount and detail, but the beating heart of the book is the in-depth accounts of multiplayer refights of Gitschin, Trautenau, Nachod and Skalitz (including a ‘what if’ version). The appendices are rammed full of useful stuff, including the authors’ amendments to the Regimental Fire & Fury rules used for the refights. If you enjoyed the first volume on the war of 1866 by this writing partnership, you won’t be disappointed. This is a more than worthy successor to the first book, and answers any unanswered questions you might have had about this oft-overlooked conflict that had such long-lasting consequences for the history of Europe. Never again would the Habsburg empire hold sway in the Germanic world; from this point on, it was Prussia all the way. It’s nice to be greeted by a list of maps and sketches, and a useful list of abbreviations, especially since some of the ranks in the German-speaking world are not immediately obvious, and you wouldn’t want to get your Feldzugmeisters (FZM) and Feldmarschalleutnants (FML) mixed up. It is this kind of thoughtful analysis that makes these books stand out from much of the fare presented to wargamers; the writers understand that of which they write, and far from simply presenting the battles they have covered as ‘scenarios’ for a Thursday evening pick-up game, they guide the reader through the proper thought processes required to understand the tactical and strategic situations, enabling us to step back into the mists of time and imagine ourselves at the head of those troops, hurriedly reorganising after a series of defeats, but convinced that they still stood a chance of reversing the tide. There follows a combination of historical narrative and after-action reports from games recreating sections of the battle which, as I can attest, were utterly gripping. Bear in mind that the situations faced by the players were fluid, complex and, at times, completely unexpected – as mentioned in the previous review, ‘DZ’ and Andrew are canny and cunning umpires, expertly judging the players and pushing them to their limits to explore both the historical possibilities and their command abilities. For some of those who took part, there were real shocks. I can only speak for myself but, for example, never having commanded miniature troops in this era, I was completely taken aback by the power of the Austrian artillery, learning a bloody lesson as I over-confidently advanced my Prussians up the slopes towards the Swiepwald. I don’t want to spoil the fun, but it’s clear from the accounts that I wasn’t the only one who learned lessons the hard way! Opening positions: my corps opposite the Swiepwald, climbing the slopes towards the woods whilst the Austrian massed columns and artillery advanced from my left. I didn’t realise how exposed I was until the Austrian guns (and rockets!) opened fire. Photo Henry Hyde 2015. One of my fleeting moments of glory – Prussian hussars crash into an Austrian column and send it packing.10mm miniatures in the collection of Andrew Brentnall. Photo by Henry Hyde of the February 2015 game. Richard Clark (left) and Chris Atkin (centre) command the Austrians at Swiepwald, whilst DZ decides how much of a mess they are in as they enter the Swiepwald during our 2015 game. The huge Austrian column flanking my position can be seen left of centre. Photo by Henry Hyde. Andrew Brentnall tells Charles Grant that he definitely can’t do something or other! Meanwhile co-umpire DZ finds something amusing… Nick Skinner looks on with satisfaction. Photo by Henry Hyde taken during Swiepwald game, February 2015. More pretty Prussian cavalry – dragoons and uhlans – 10mm miniatures from Pendraken, painted by Fernando Enterprises. Photo Henry Hyde 2015. Chris Atkin (left) looks on as DZ attempts to disentangle the messy combat in the Swiepwald. Charles Grant checks that he won’t lose his hard-won advantage! Meanwhile Andrew checks ranges between the Prussian flanking force and Austrian infantry. Photo Henry Hyde 2015. The opening chapter examines the position on the eve of the battle and the challenges faced by both Benedek and Moltke as the Austrians and Saxons recoiled south and east from the onrushing Prussian columns. This is followed by a short chapter on the organisation of the armies, illustrated by some glorious photos taken at the 150th Anniversary Commemoration on the battlefield, featuring hundreds of beautifully-attired re-enactors – perfect uniform reference! Then comes a short chapter on the decisions made by the writers about recreating the battle in sections, and the ruthless editing of all the possibilities down to a choice of just five games makes fascinating reading – something that all those considering taking on a large battle should consider. Then we plunge into the nitty gritty that we all love: Chapter Four, Holawald; Chapter Five, Problus; Chapter Six, Swiepwald; Chapter Seven, the Nedelist ‘What If?’ game; and then the entire battle fought as a game in Chapter Eight. This is wonderful stuff: the historical setting, the players commanding the forces and the briefs they were given, detailed Orders of Battle, colourful maps and lovely photos of all those 10mm troops manoeuvring across delightful terrain. Not everyone can write good after-action reports, but the DZ-Brentnall duo do it with aplomb – there’s no rambling here, but certainly plenty of excitement and commentary as, to their delight, the players either grasp the nettle and realise the opportunities, or fail to spot the dangers and are punished accordingly! The first three games were fought twice, in fact, giving the additional insight of different players facing the same conundrums. The final episode was an attempt to fight the entire battle of Königgrätz as a single game. This was a huge challenge, even for the DZ-Brentnall alliance: “At the end of mobilisation, the two armies together numbered over 9,000 figures” (p.127). Yes, I’ll write that again: nine thousand figures! “What was obvious, however,” they continue, “was that even with our substantial resources, we had neither the troops, the table space, nor the time to game the entire battle using RFF [Regimental Fire & Fury].” So the search for rules was on, and inter alia, they discovered that the ‘footprint’ of their miniature armies was a staggering 44 square feet! After considerable investigation, they settled on an amended variant of Bloody Big Battles, but you’ll have to read the book to find out more, together with the account of the epic game, which involved three players per side plus the umpires. Chapter Nine, “Conclusions”, is another opportunity for the intellect of our two guides to be put on display, and their thoughts are cogently expressed. It is rare to find a period of military history – especially one as fleeting as this – squeezed until the pips squeak, but here the authors wring everything they can out of their experiences, whether conducting original research, walking the battlefields or umpiring these gargantuan games. And in Chapter Ten, “The Battlefield Today”, they generously share the spoils of their many visits to the site, with lots of colour photographs and insightful notes, pointing out how the ground may have changed since 1866 and which troops were positioned where. They also indicate the best ways to drive and walk around the area, together with the amount of time you should allow to cover the ground. Just these notes on the topography of the battlefield are, in themselves, highly informative. The book ends with a series of Appendices: the full, historical Orders of Battle; the later careers of the key figures involved; some very useful suggestions on further reading, including commentary; a fascinating overview of The Reilly Memorandum, a key contemporary document giving detailed information about the Prussian army, its equipment and specifically, its ammunition expenditure during the battle; a list of rulesets for playing the period; and finally, a critical page of “Place Names then and Now”, invaluable because the battlefield is now within the Czech Republic and many of the original place names have changed. That’s a huge amount of information crammed into just over 200 pages and if that doesn’t inspire you to take another look at this ‘Cinderella’ period, then nothing will! I can only say from my perspective that, as someone invited to play in one of the games featured in the book, it was a revelation, both as a historical period and as an enjoyable – if salutary! – gaming experience. The authors have crystallised that experience in these two volumes, which must be rated as nothing short of a tour de force, both in terms of the scope of the project and the expression of it. These two, handsome volumes could easily represent everything you would ever need to play the period, bar some additional uniform reference (see below). “Highly recommended” hardly fits the bill here. The print runs were limited in numbers for both volumes, and let’s just say that I am hugely grateful to have these books as review copies – they are, quite simply, the Alpha and Omega of wargaming literature on the subject, and deserve to be read by professional historians too. If you can get hold of a copy of either title, do so! For its outstanding contribution both to the history of the Austro-Prussian War of 1866 and the guidance it provides for recreating its actions as tabletop wargames, Königgrätz 1866 by John Drewienkiewicz and Andrew Brentnall is awarded the Battlegames Award for Excellence. Buy Volume 8 from Caliver Books and Volume 12 from Ken Trotman. My hope is that these limited runs may be reprinted or become available as ebooks or print-on-demand paperbacks. Cavalry engagement at the battle of Königgrätz (Alexander von Bensa, 1866, public domain). Painting in the Heeresgeschichtliches Museum Wien. Wargaming in History Volume 12, Königgrätz 1866 was launched at Salute this year and followed Volume 8, The Austro-Prussian War of 1866: the Opening Battles published in 2013. These landmark volumes are clearly a labour of love and cover what is, in wargaming terms, rather unusual subject matter, so I’d be grateful if you’d answer the following questions for our readers. What drew you to the war of 1866 as historical subject matter in the first place? Andrew was on a Seven Years War Battlefield Tour with Christopher Duffy in the mid 1990s, and he stopped the bus on a little hill in Bohemia. He said we couldn’t travel past here without stopping, as it was the scene of one of the most important battles of the 19th century – Königgrätz. A brief visit to the old museum and Andrew was hooked. Then, posted to Vienna, he had the opportunity of driving up at weekends to explore the battlefields. John, who was working in Bosnia, worked his schedule so that meetings in Vienna always happened on a Monday or Friday and attached a weekend, and joined in on these excursions. The rest, as they say, is history! Given that relatively little literature exists on this war, especially in English, what obstacles did you face in terms of researching the campaign? And tell us about the volumes that you discovered had been destroyed in an act of ‘vandalism’. Early research was easy, there were two books in English available at the time, a magisterial work by Gordon Craig written in the 1960s, and a more bodice-ripping, if less balanced, one written by Wawro in the 1990s. But the desire to probe deeper proved more difficult to satisfy. An English translation of the Prussian Staff history was the next acquisition, but it had no maps. So Andrew began to develop his now legendary google fu skills in search of maps. He found a copy of the Original Austrian Staff History, published in the 1860s, complete with maps, for sale in a Copenhagen bookshop. It had been discarded by the Danish Cadet School! This proved a gold mine. It also forced him to start learning German! So began a steady accretion of German sources over the years which began to illuminate the darker corners. An extra boost to research was the release by Bruce Weigle of a volume of wargames rules called 1866, which contained an amazing bibliography and very useful maps. Andrew has spent much of the ensuing years acquiring the books on that list! John added the following, as it describes his own specific experience. In the mid 1980s I was an instructor at the British Army Staff College at Camberley, which incidentally delivered the best military syllabus that I have ever encountered, and to which I attribute what little success I have ever had. Anyway, this lecture hall was shelved down its long side, about 100 feet, and the shelves were entirely filled with the General Staff Histories the the Wars of the 19th Century. From the Crimea through the 1860s to the Franco-Prussian War and the now forgotten wars between Russia and the Ottoman Empire in modern Bulgaria. There were rows and rows of them. Many were of course not in English, since they weren’t our wars, but that was not a huge problem as in the late 19th Century British Officers were encouraged to learn foreign languages and were even paid extra for their skill. It was a real treasure trove that few were aware of, and because the British Army was then obsessed with Northern Ireland it was not a huge priority. In the mid 1990s, as part of the cost-cutting regime associated with giving the Armed Forces the ‘freedom’ of running their own budgets, the three Service Staff Colleges were amalgamated into a new build at Watchfield in Shrivenham, southwest of Oxford. This allowed the MoD to give up the historic RN Staff College buildings at Greenwich and to sell the site of the RAF Staff College at Bracknell (which wasn’t historic but it was on prime development land). The empty Army Staff College was allocated to the Services Medical Directorates, which enabled the MoD to sell off the Medics’ Establishment in Central London. As part of this collective dumbing down of professional training, a pitiful amount of space was allowed for the library in the new Joint Staff College. Given that it was for all three services and each one had had a huge library, one might have expected that the three collections went into a substantial space. Not so, I am afraid. The Joint Staff College Library is a cramped and uninspiring place with no room for anything not currently deemed useful. About 6 years ago, I visited to give a talk and looked into the library. By then I was much more ‘into’ the 1860s and asked the Head Librarian whether any of the myriad volumes were in his collection. He took me to ‘The Camberley Archive’ which was about 8 feet of shelf. He explained that the other books, which were ‘not required’ were ‘disposed of’. Given that every perceived injustice now requires a full Public Enquiry, I look forward to learning that one has been set up to investigate this appalling cultural vandalism. To what extent were your opinions about the decisions made by the Prussian and Austrian generals informed, or even changed, by your experience of actually walking the battlefields? More than can possibly be described. As we walked these fields, and read more, we gained immense respect for the professionalism of those who fought on both sides in this war. The popular image of Austrians as dull, aristocratic idiots commanding stupid and cowardly troops was gradually replaced by one of professionals caught in an awful physical and technological trap, from which they could not escape, bound by decisions on weapons and tactics which had been reached (for perfectly sound reasons) well before the war actually started. Walking the fields revealed the idiosyncrasies of the terrain, and the number of covered approached to key positions, which so suited the Prussians’ method of war. Also, when you put it together with what we were learning about the ranges and capabilities of weapons, the battlefields, and the accounts of the actions fought on them, began to make much more sense. Wargamers might be surprised at how many major battles there were in a war that only lasted seven weeks. Can you briefly explain why that was? The Prussians determined to invade Bohemia at the earliest possible opportunity. 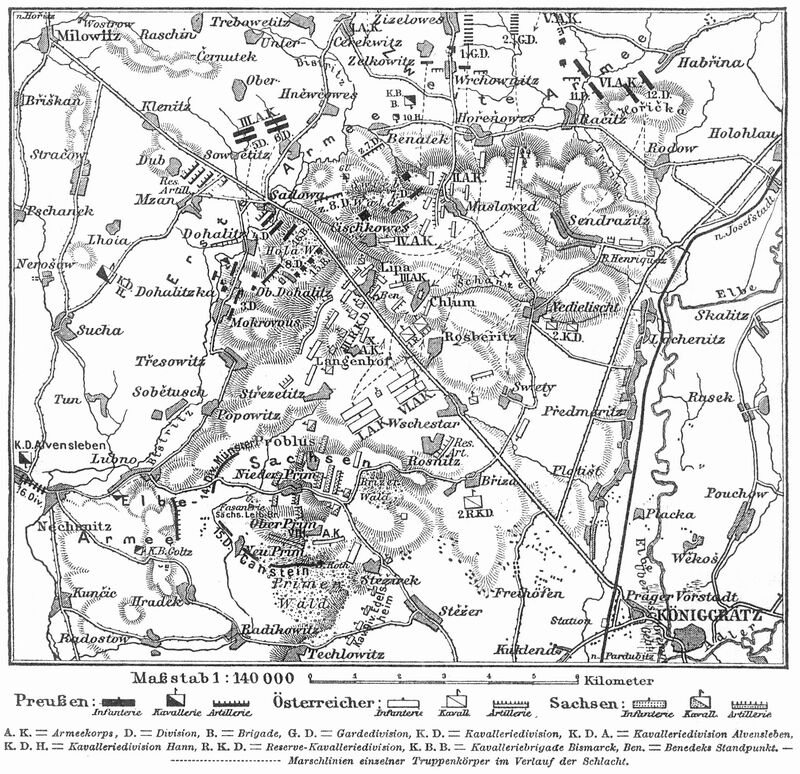 Von Moltke’s intent was to use multiple routes to invade, and then unite his separate armies on the field of battle. This made maximum use of both the railway resources within Prussia, and the main passes into Bohemia through the mountains. It resulted in about 240,000 men erupting into Austrian territory via three major routes. The Austrians had hoped to occupy a central position, from which they could concentrate their forces against their enemies in turn. Unfortunately, their mobilisation hub was at Olmutz, way to the south, and by the time they were making their way into Bohemia, advancing along just one railway line, the Prussians were already arriving. The only forces already in Bohemia, the 1st Corps and the Saxon Army, had to try and defend in the West, while the rest of the army tried to cover the passes in the East and North. This led to a series of ‘frontier’ battles, as the Austrians attempted to stop the Prussian armies joining up. That there were half a dozen of them was chiefly the result of the Austrians arriving late, and therefore piecemeal, unable to make their initial numerical superiority tell. Staggeringly, the passing of a few hours was sufficient to give the Prussians the advantage, both at Trautenau and Nachod, and the Austrians would pay for it in blood. Königgrätz (also known as Sadowa) was a huge battle and you decided to break its recreation into separate games. Can you explain this decision? This question practically answers itself. When Andrew started to collect armies for this war, he did so on a basis of about 1:50. This resulted in collections of about 6,500 and some 250 guns. It was just conceivable that we might be able to deploy these on a single battlefield, but when we considered Königgratz was fought over a field more than 12km long and 8km wide, it became clear it might not be practical. We were also concerned that any gamer would have far too great a field of view, one the contemporary commanders could only dream of. And, the more we examined the battle, the more it became clear that there were a number of key moments and locations within it which lent themselves to more detailed treatment. That said, at the end of the process, we still succumbed to the temptation to play one huge game covering the whole battle, using a different set of rules. Given that relatively few figure manufacturers cater for the wars of the 1860s in Europe – compared, say, to the huge number for the American Civil War, for example – how did you set about collecting armies for the battles and what decisions did you make along the way? We had a brief flirtation with 15mm figures to begin with, as this was the scale used in our ACW collections. It soon became apparent, however, that the size of the armies required made this less than practical, both from a financial and spatial point of view. This led to an examination of 6mm and 10mm, and a few samples quickly tipped us towards Pendraken’s 10mm ranges. We have been particularly fortunate that as we have collected, their range has got bigger and bigger, and their sculpts more and more accurate. Over the course of the project the whole Saxon army has been replaced, as has all the Austrian cavalry. Once the scale of figure was settled at 10mm, we had to look at the level of detail we wanted in our battles. We have both tended towards the simulation end of the wargaming spectrum, without losing sight of the need for fun! This then necessitated a game which would allow us to represent the different tactical systems and formations used by both sides. This imposed a minimum size on our battalions which would allow us to represent the company formations that were crucial. With Prussian battalions in four companies, and Austrian six, we were driven to 12 base battalions, each base holding four figures. You have amassed considerable armies for the period in 10mm: did you paint all of them yourselves, or did you get outside help? And what about the beautiful terrain that can be seen in the photos in the book, and which I’ve had the pleasure of playing over myself – is that home-made? The figures have been painted by a number of sources. Andrew has done some, a long time friend, Dave Hathaway has done others, but by far the majority have been painted by Fernando Enterprises to their Showcase standard. These were, quite simply, superb. Andrew would have liked to have painted more but, like so many of us, time was always at a premium. When you are young you have unlimited time and no money, so you paint more. When you are old you have less time but more money so you paint less! The terrain was produced by the incomparable Keith Warren of Realistic Modelling services. Sadly, Keith has now taken a well deserved retirement, but over a number of years we have both amassed a sizeable acreage of his terrain, with enough variants to allow us to reproduce almost any field. How about rulesets? I know that you finally settled on a variant of Regimental Fire & Fury, but were there other candidates? What led to your decisions? Yes there were always other candidates, chief among them Bruce Weigle’s 1866, Real Time Wargames Trapped Like a Fox, Chris Pringle’s Bloody Big Battles, Brigade Level Fire & Fury, and In the Age of Bismarck and Napoleon III by Brian Phillips. But, in the end, it was our familiarity with RF&F from our ACW games, together with the level of granularity that we were seeking, that led Andrew to experiment with the modifications necessary to translate them across the Atlantic. Rich Hasenauer was also extremely helpful and supportive when we consulted him about publishing these amendments in our first book. In what ways has wargaming the conflict answered questions that the historical research alone could not; and are there any that, for you, still remain unanswered? It has provided another dimension, to set alongside the reading and the battlefield walking. In particular, issues of time and space, deployment room, problems with bottlenecks, the interaction of different tactics and weapons, all become much more real when you are wrestling with a mass of tiny troops in a restricted area. Some of the most famous names in the hobby have found this process testing in the extreme, convinced that they would never have got themselves into this particular starting position. Finally, what do you feel are the major attractions for wargaming the period and how can you persuade someone that it’s worth playing the historically-defeated Austrians? The attractions of wargaming it are very similar to the attractions of studying it. It is a period of transition. It involves large armies, which still march to battle with colours flying and drums beating, and brightly bedecked hussars flitting about hither and thither, while their heavier brethren stand menacingly silent. It is a time when technologies are playing a deadly game of leapfrog, as rifling and breech loading begin to be adopted for both sides’ arms and artillery. Generals are faced with huge difficulties trying to accommodate the effects of these changes on the field, and come up with the magic formula. History shows that the Prussians were in the ascendancy at this time, but the challenge is to see whether the Austrians can improve on their historic performance. They did actually win at Trautenau in real life, and it takes a talented commander to use Prussian tactics effectively. Careful choice of terrain, positioning of artillery, timing of attacks, and judicious use of cavalry are all weapons in the Austrians’ arsenal. What better test for a tabletop general than to try and win against the odds for Kaiser and Fatherland? On the other hand, if you want an easy life, and an army of super troops who will survive even your own most bizarre decisions, this war is not for you, either as Prussian or Austrian! My thanks to John and Andrew for these wonderfully full answers and I wish them well with the new book. Every wargamer keen on the 19th century should have them on their shelves! If you’re a fan of 1/72 plastics, then see Plastic Soldier Review – you’ll have to mix and match Franco-Prussian War and Italian War of Independence figures, with some conversions. If you know of others specifically for the Austro-Prussian War, please let me know or mention them in the comments. Battlefield Anomalies: The Battle of Königgrätz Revisited (an absolutely amazing extended article on a well-illustrated website – highly recommended). A very interesting article, I to hope it is available at some point in a different format. Thank you Keith. In what format would you like it to be available? Thank you for including my article on the battles and campaign of 1866. You’re welcome — wonderful website! Thanks for this review and interview. I have now ordered the book, and look forward to reading it. I’m glad it was useful, Atle. Thanks for visiting! Many thanks for the interesting article and interview Henry. Since I’ve just finished reading Wargaming in History vol.8, I now know what to use (part of) my next paycheck for! I’ll probably never game this war, but it is very inspiring literature. Thanks for stopping by, Wim! Henry, this newsletter was a tour de force. Very engaging content, interesting exchanges with the authors and a comprehensive list of the resources at the end. Thank you! The format rewards this approach. Spotlights on similar unsung conflicts always welcome! Thank you Tim, glad you enjoyed it. Henry, what a cracking review, thank you. I have had the privilege and honour to be one of the blokes who took part in several of the games featured in the book and have wilted under the scathing but always witty (and always justified) comments of both Andrew and John at my inept command decisions. I have also been very proud to receive their praise on occasion. I was also able to take part in the big complete battle game using the BBB rules – an amazing experience. Finally I’m very proud to say that some of my photographs were used in the final publication. All in all it was something I wouldn’t have missed for anything and a gaming experience I’ll remember for a very long time. Once again thank you. Thanks for stopping by, Ernie – and I’m jealous about the big battle! Would have loved to have been there, what an experience. Hi Ernie! I too had the pleasure of being involved in the epic Koniggratz day. It was a privilege to participate in this game using Andrew’s adaptation of my BBB Koniggratz scenario. Henry, thank you for this terrific review of an important book by two real experts. Hi Chris, and thanks for dropping by. Glad you enjoyed the review. A good read Henry. They’re both excellent books. I’ve been wargaming this war for maybe 20+ years in both 6mm and 28mm and have fought just about every battle in Bohemia and in the western theatre except Konigratz. My original inspiration was the book Konigratz by Gordon Craig and the old Airfix magazine articles showing how to convert their figures into the major and minor combatants. I’d forgotten those old Airfix magazine articles – thanks for the reminder!